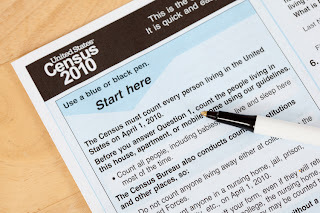 As students and faculty are most likely aware, the 2010 U.S. Census is underway. In fact, you might have already received one of the census forms, which are being mailed to all households in March. As of April 1, dubbed National Census Day, census takers begin knocking on doors and visiting households that did not fill out and return the form by mail. The 2010 Census helps your local community receive federal funds for everything from education to roads and bridges. It also determines the number of seats for your state in the U.S. House of Representatives. Don't forget, participation is required by law (though it rarely comes to that). Ask to see their ID. All census workers carry official government badges with their name. They might also have a "U.S. Census Bureau" bag and a handheld device. The census taker will never ask to enter your home. The census worker might ask you for basic financial information, like salary range. NEVER disclose your Social Security number, banking, or credit card information. If asked, immediately close the door and call the police. The U.S. Census will NOT contact you by e-mail. The form cannot be filled out online. Don’t click on e-mail links that look like census information. The U.S. Census Web site provides some additional tips for preparing for a visit from a census taker. The Census is a great opportunity to help your community. Remember, be supportive, but be cautious!